During the 2010 Rock ‘N Roll marathon in Denver, I found myself in lower downtown photographing some of the runners as well as the early morning light. 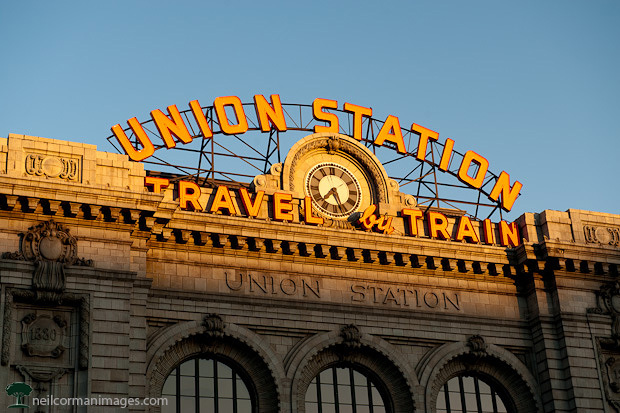 As I prepared for the runners to come past Union Station, I saw the first signs of light starting to shine on the sign at the train station capturing this scene under blue skies on a chilly morning. As the days get shorter the amount of time available to capture an image in daylight gets more challenging. 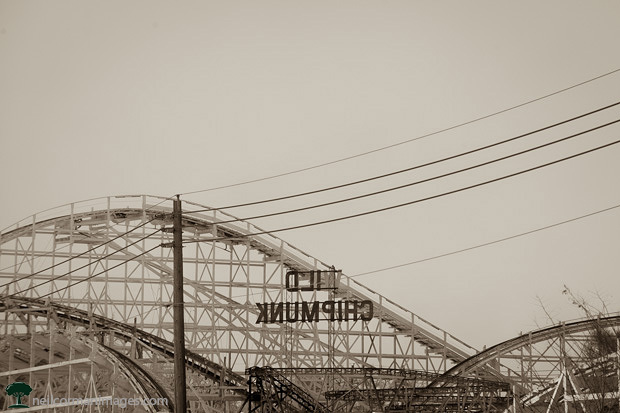 On this evening I was heading out around Lakeside Amusement Park and thought I would stop by to see if I could find an image. Right after parking the car and walking towards the park I noticed this scene. The challenge was finding the right position which didn’t put me right in the middle of a road near the park. After checking out the location options along the road I did find a safe location to capture this image for Day 22 of Thirty Days 2013. 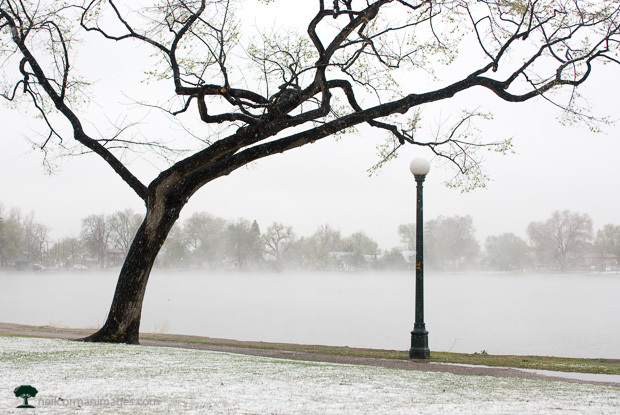 Along the Front Range it is not uncommon to get a late season snowfall and as I watched the snow fall from my office window on May 1st I grabbed my camera and headed towards the park. My initial plan was to photograph at the south end of Washington Park, but as I passed by the lake and noticed the steam rising the plan quickly changed. I photographed around the lake and after almost completing a loop found this tree. By this time the snow had started to turn to rain letting the grass of spring show through the wet snow. 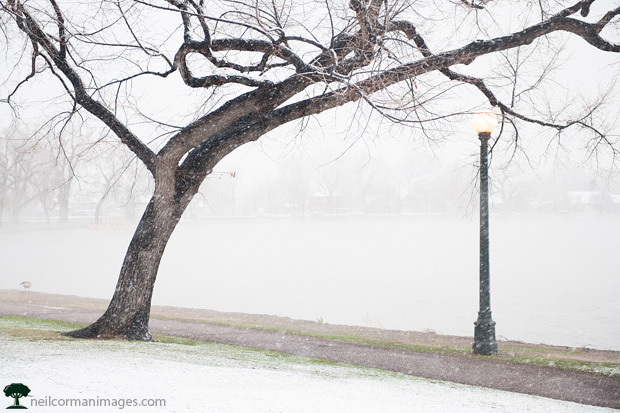 It was five years ago I first photographed this tree in Washington Park here in Denver. Just like five years ago it snowed today in Denver and this snow is giving us a little more than in 2008. This is indeed a new photograph of the tree as I headed to the park to photograph the tree as well as others areas in the park. The question is will this be the last snowfall of the season, at the current rate I would say most likely not. 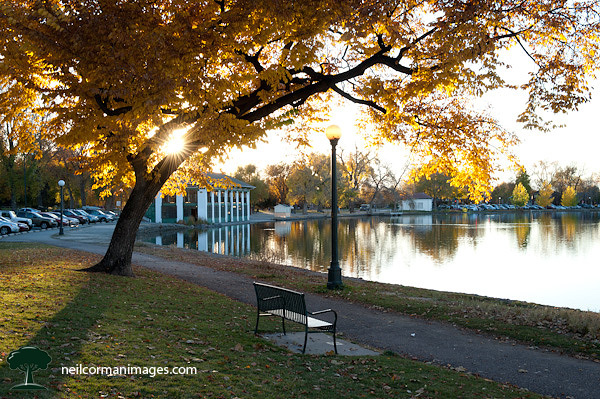 There is a tree in Denver’s Washington Park which I have photographed a handful of times. One November, I was thinking of photographing this on my way home from picking up some film which was just processed and as I approached the location knew this would be Day 2 of Thirty Days. The late afternoon light was lighting up the remaining fall colors on a nice day, and as I explored the different angles of the tree I decided to include the sun in this photograph as it had not been possible on the other days at Washington Park. Spring in Colorado one year had a record high of 84 degrees on Sunday. Yes, it snowed on Monday night into Tuesday producing scenes like this around the city. When I woke up Tuesday morning and looked out the window I knew I would be heading to Washington Park with my camera to photograph the tree I first found in a similar scenario on May 1, 2008. 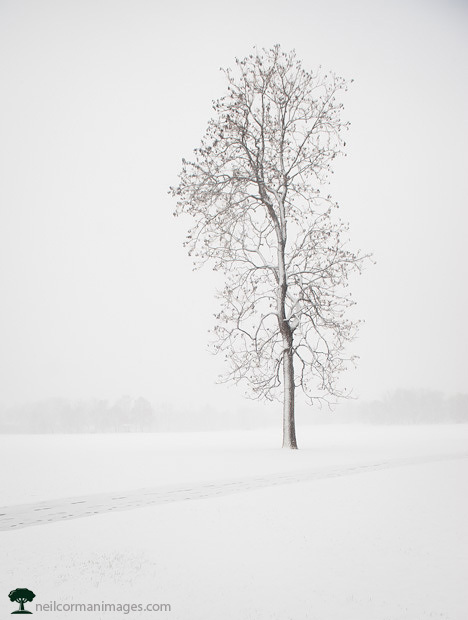 I did photograph that tree but decided to explore the park for a little while as the wet snow continued to fall. The tree above is one I first found in early 2008 and went looking for it in the snow. It was closer to my car then I remembered, which threw me off a little bit but after spending some time looking for a good angle created this image prior to heading home. This year I traveled from Singapore to Montreal and many places in between. 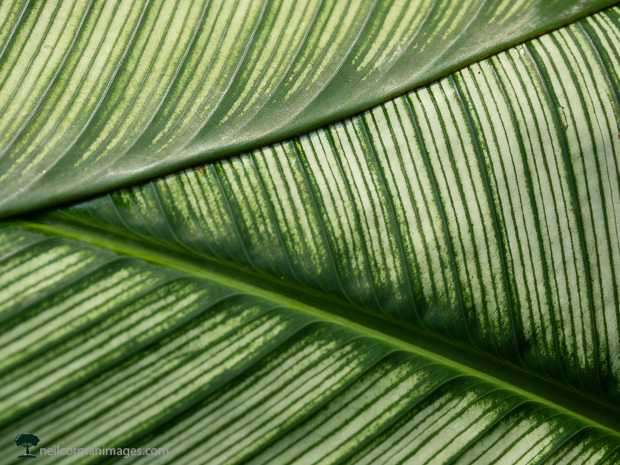 As I do each year I reviewed the images which I took during the course of the year and narrowed it down to 12 of my favorite images from over 5000 images taken during 2018. I also tried to highlight various areas which I traveled which you will find below. I have photographed The Dancers a few times in different conditions. When approaching the subject I am now looking for new angles even if it is moving the location of the dancers within a few inches to the Colorado Convention Center. As the snow was falling I was moving so slightly to place the hands of them in a location on the building. 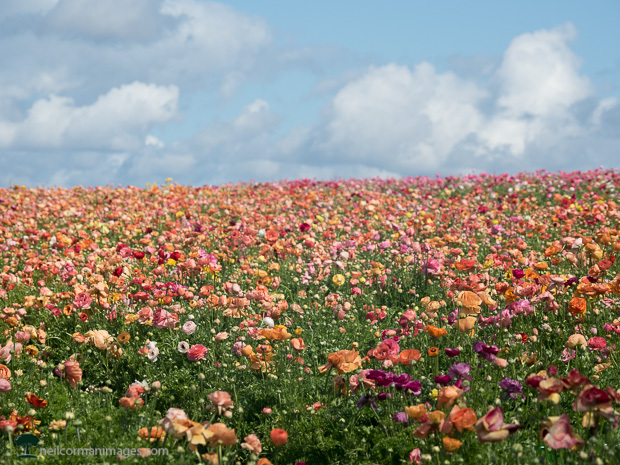 During a trip in March to San Diego I was able to experience the fields of wildflowers near Carlsbad. Under soft light I walked through the fields and captured the spring growth. I was in Washington DC during the annual Cherry Blossom Festival. I was a there a little past the peak but there was still plenty to capture along the Tidal Basin as well as around the city. It was a little windy one of the days I was there and noticed the movement of the water in the basin. With the cherry blossoms starting to fall off from the wind as well there were areas in which the blossoms were gathering. 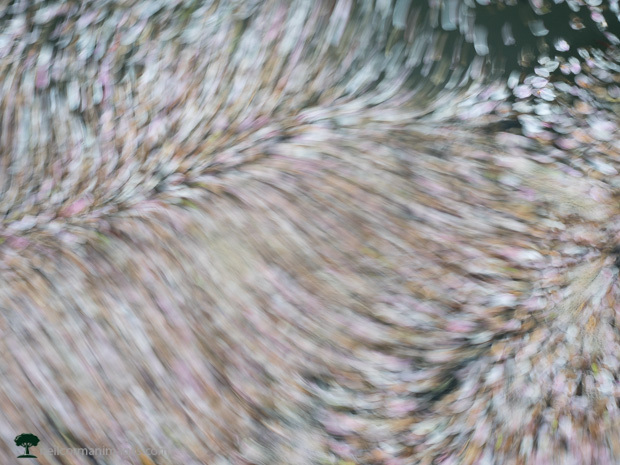 I pointed my camera towards these areas and let the motion from the water make the image. Walking around Olympic Stadium in Montreal I noticed the light on the metal buildings as they reflected the midday light. 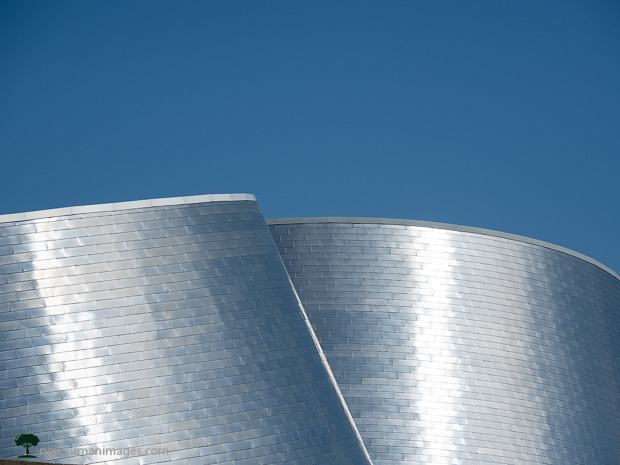 Working from different angles I was able to position the buildings overlapping with a nice blue sky to add to this minimal photograph of the Rio Tinto Alcan Planetarium. 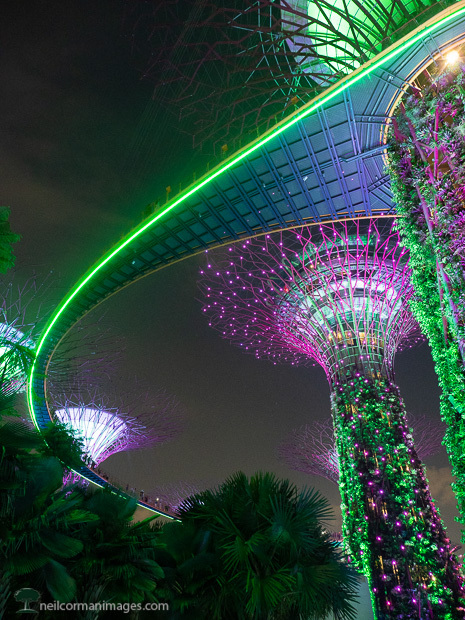 The light show at Gardens by the Bay in Singapore is a great experience. Earlier in my visit I had ventured to the path above but for the light show found a nice perspective and captured the show in addition to sitting back and taking in the experience as well. 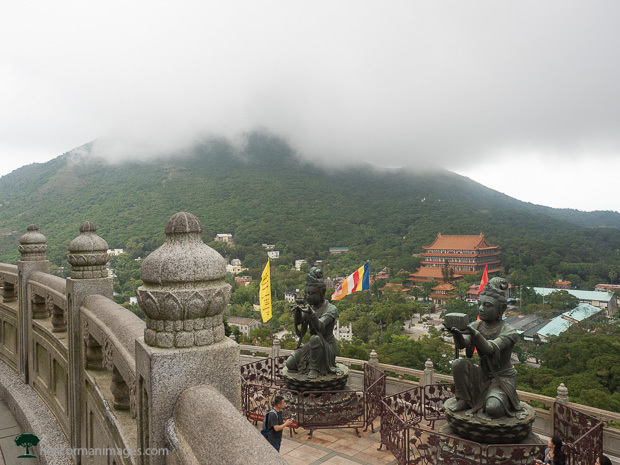 When in Hong Kong I made a trip out to the Big Buddha on Lantau Island. Climbing the 268 steps to get to the statue as it looks out above you is an amazing experience. It was an overcast day but this allowed for the low clouds to set the scene as I looked towards Po Lin Monastery. On Hong Kong Island there is a whole transit system of trams. On one day I became familiar with the system due to a lost mobile phone. 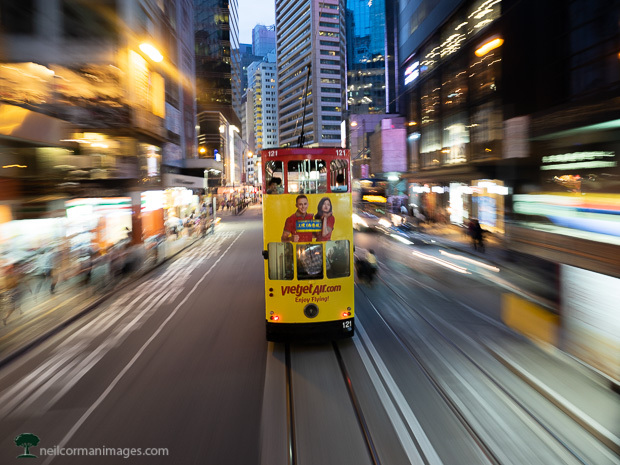 As I sat in the front of the tram on the upper level I was able to capture the motion of the tram as it went through central Hong Kong around sunset. Using a longer shutter speed the movement of the tram allowed the blur to occur. 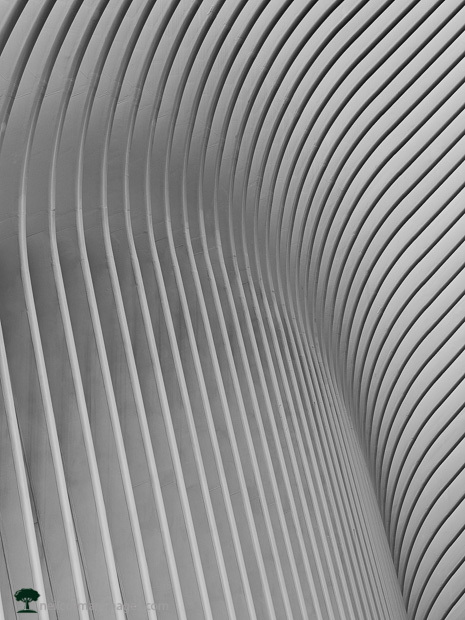 Walking around the Ground Zero area in the Financial District of New York the lines of the Oculus caught my attention. The Oculus is the new transportation hub in that area and is a great looking building. With my camera I zoomed into areas of the structure to capture the abstract shapes the lines created within the building. There has been a great amount of growth and building in Hudson Yards at New York. As I walked the Highline Canal I noticed the lines of these two buildings. 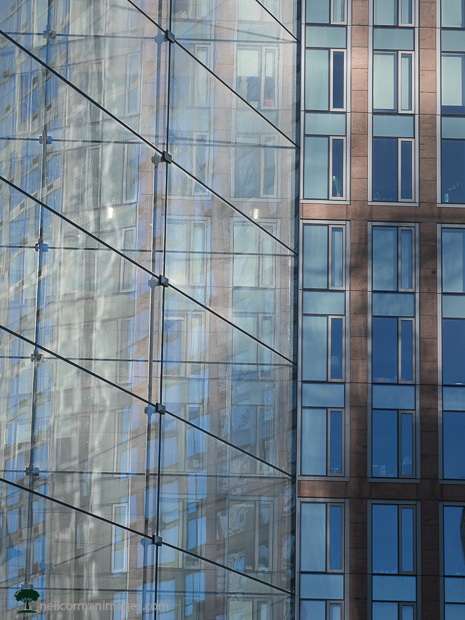 The glass reflecting the background building while post showing their vertical lines caught my eye in this image. While in Montreal during the fall there was plenty of fall foliage in full display. The various colors on the trees and ground were quite impressive. 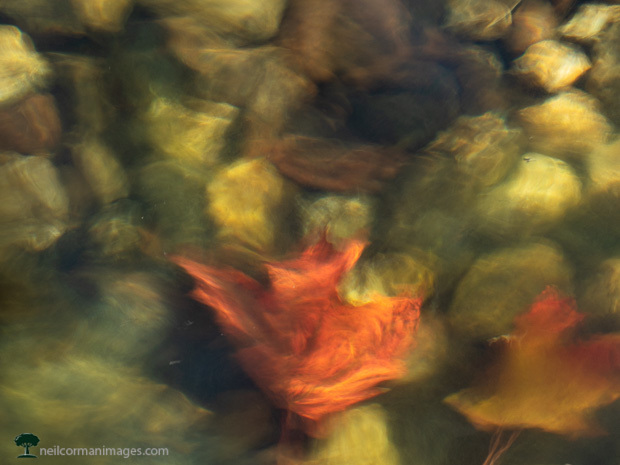 As I explored the city I came across a pond with leaves which had fallen into the water. With the moving water I used a slow shutter speed to capture a little of the movement of the leaf against the rocks on the bottom. 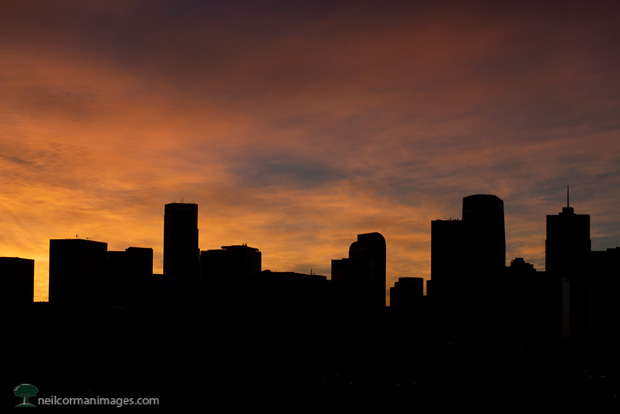 There is something about a November sunrise in Denver. I have photographed during this month many times and always find great color in the sky. This year was no different as I silhouetted the downtown skyline to capture the color of the sky and the lines of downtown. These lines continue to change as Denver the growth of the city remains. 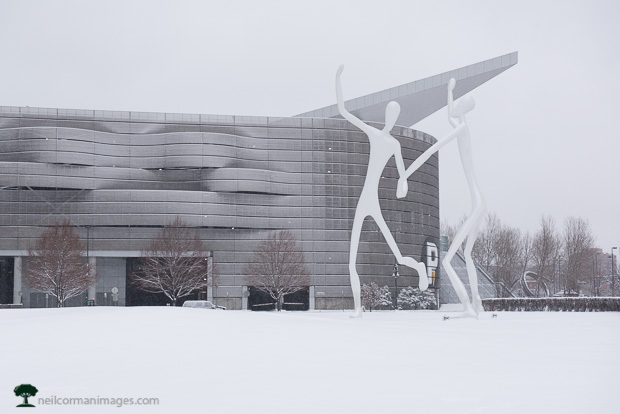 Thank you for looking at the images I selected for 2018, and I look forward to capturing more images from Denver and beyond in 2019. 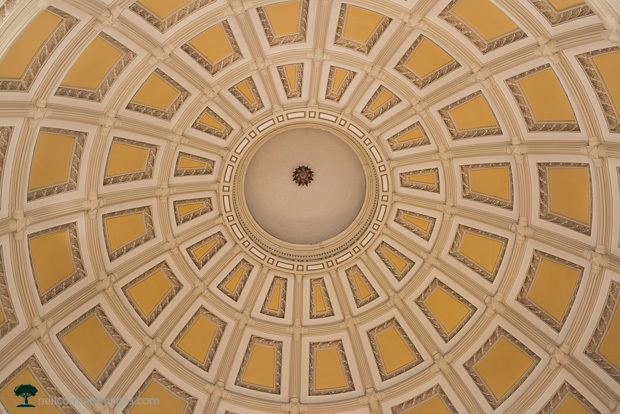 When you climb the steps to the public area in the dome of the Colorado State Capitol you start to get the sense of the detail of the dome itself. There are actually two domes within the building itself. The interior dome as seen here allows plenty of natural light to come into the building through the open areas as the dome climbs above the building. The center section of the dome can actually move to allow materials to be hoisted above this section, however getting access to that area is not all too common. 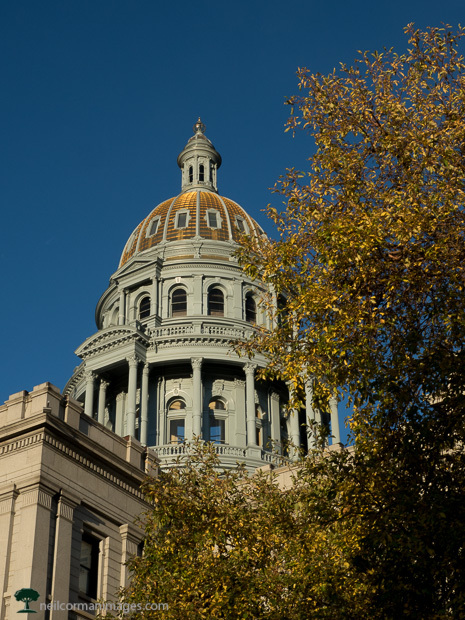 The Colorado State Capitol dome stands against a deep blue sky and with changing trees in the foreground. Situated on a hill there is the extra hint of power of the building as you look up climbing the steps to the building. 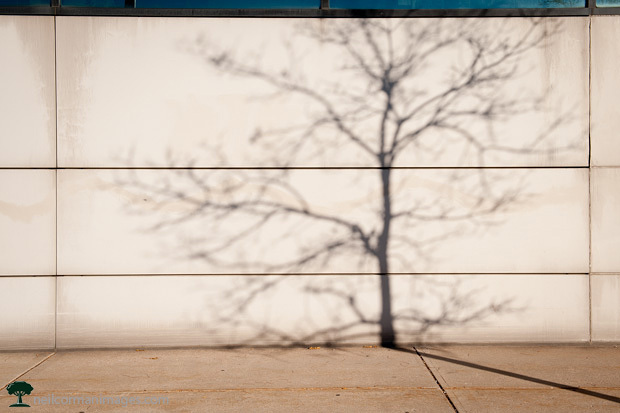 On the first day of the Thirty Days project in 2010, I walked around the neighborhood looking for changes in the season when I encountered a building with a blank palette. In the afternoon light the small trees along the street were casting a shadow on the building which I found interesting since the trees had already lost their leaves bringing the two similar empty items together.